If you are a reader of Gun Carry Reviews for any time at all you probably know we haven’t delved into the world of Armalite Rifles because we stick to discussing what we know. Sure, we’ve shot AR’s but its not like I can strip one down and rebuild it with my eyes closed like I can with a 1911. I can shoot anything but that doesn’t mean I am a reliable source of information on the subject. So we’ve decided 2016 is the year we will expand our experience into the realm of the black rifle. With this in mind I set out to speak to as many companies as possible to learn what sets them apart. So in this article I will discuss the things I found with different companies and share what I picked up so far. Please understand this is all about fact finding and we aren’t promoting any particular brand at this time. 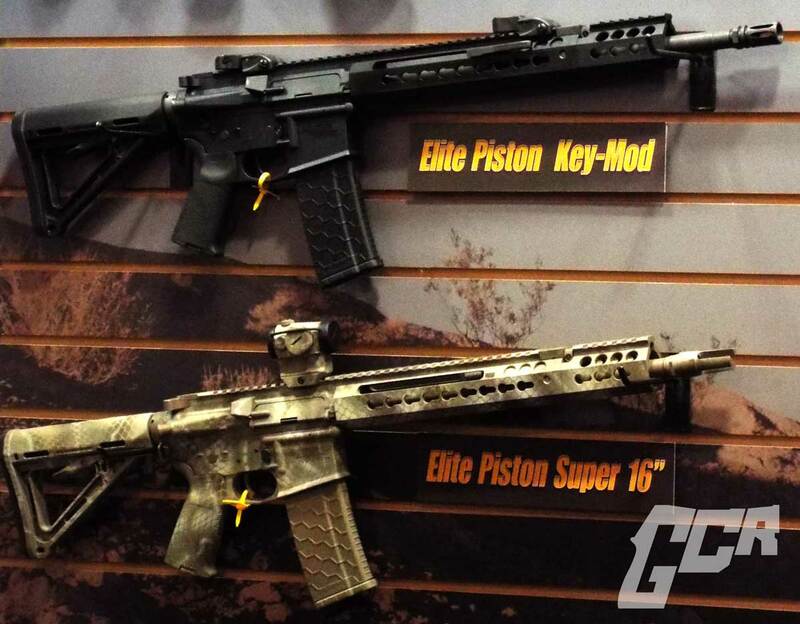 Also, there were many other companies that were represented well in the AR market at SHOTShow. But I don’t want to write about information I didn’t collect first hand. 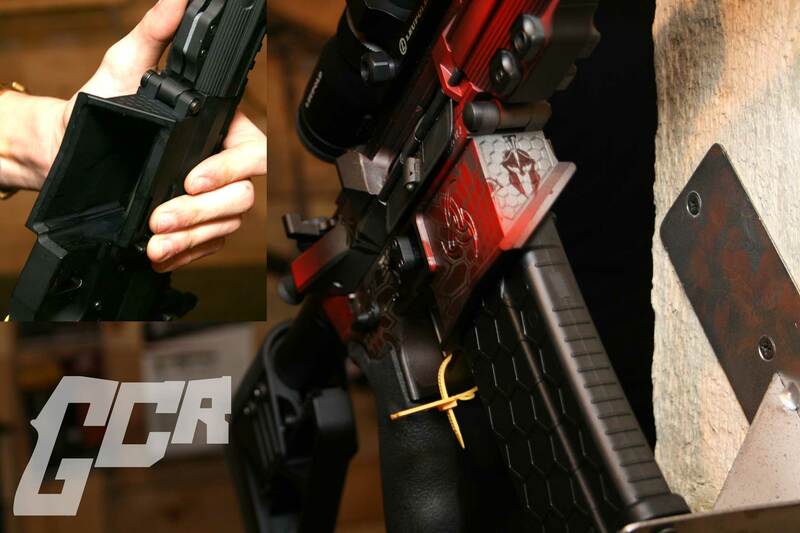 Adcor has some interesting features that set them apart including 3 patents used in their rifles exclusively. They were good enough to explain the differences on video for us. Also, because the differences are all in the upper you can ‘upgrade’ your existing AR by adding their upper and taking advantage of those patented features. We spoke with the guys at CMMG for an extended amount of time but honestly I don’t feel I came away with any information other than the catalog, a price range that starts a little high than I would like and the fact that they are very excited about their new AR/AK Mutant hybrid line. We saw some things that would set them ahead of others with durability in that line but again… it wasn’t the information we were looking to get. One of the popular stops at Industry Day at the Range was Cobalt Kinetics. They had lots of buzz about the reengineered AR platform that allows the user to drop an empty mag automatically and charge the rifle automatically once a new mag is seated. Having seen the video that was going around, my immediate question was “do you have a choice?” I wanted to know if you had to operate the rifle that way or if you could turn off the options for situations like sighting in your rifle. I asked these questions first and it seems I wasn’t the only one. Cobalt told me the rifle was a prototype at this point and after the feedback they plan to rework the mechanism again to allow for a selector switch of sorts to allow the shooter to switch between modes at will. That’s the prototype, so what do they have available for sale now? 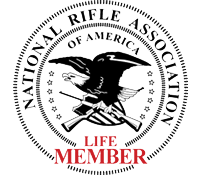 Well, they have a line of rifles known as the B.A.M.F. (Billet Aluminum Manufactured Firearm… or so the lawyers say…) I think we know what that stands for. The B.A.M.F. does have some nice features. First the look is futuristic and uniquely stylish. The weapon has ambidextrous controls and a 45 degree safe/selector switch. The most notable feature is a dual forward assist that also acts as a bolt release. It all adds up to faster reload and firing while keeping the weapon shouldered. These are worth a look. Our stop at Core was short and we got a very popular response about how much of the rifle is made in house by Core. The real reason I stopped was the great flag design on one of the rifles. It was just a great look and it pulled me in. As for more important information. When they talk about making so much of the rifle, they are one of the few that makes their own barrels. That’s a plus. The range of pricing is really all the way across the board but the “NO BS Warranty” is nice. No matter who bought the rifle of the amount of use, its covered. Another nice offering; Core has the 6.5 Grendel and 6.5 Creedmoor chambering available. 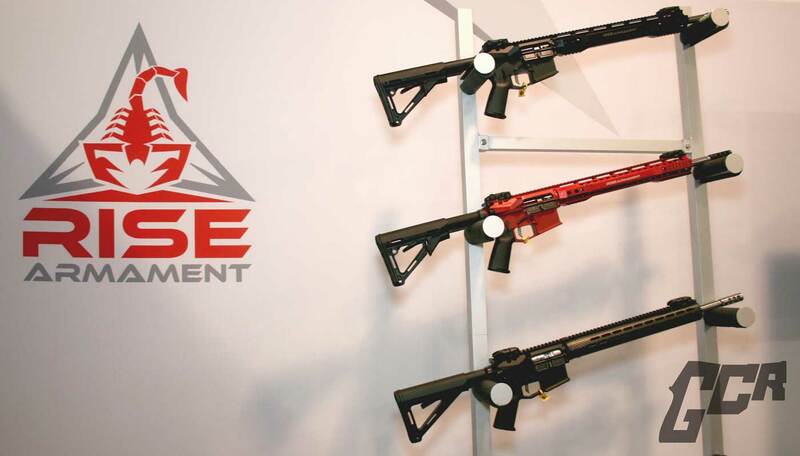 If you want to learn a little about the AR platforms the Core Rifle Systems 2016 Product Catalog actually offers legitimate education on Mil-Spec vs Mil-Standard, Gas Impingement vs Gas Piston systems, Twist rates, Carbine vs Mid-Length and Forged vs Billet. I got a chance to shoot a Daniel Defence and while they don’t really make any entry level rifles I shot the lowest level they had available. Of course this is still a higher end rifle, but now as expensive as you may be thinking. While the company obviously has a large marketing budget they aren’t taking advantage of the customer to pay for it. Daniel Defense was the first company to answer my often asked question with “We manufacture everything in house to strict quality standards. Except the magazines which are Magpul.” That said, the rifle was a real pleasure to shoot and while standing I was spinning a steel over shoulder “hostage” target back and forth with ease. Though as usual, I was annoyed to hear a buffer spring vibration (though not as pronounced as many). My conversation with Doublestar was somewhat different from most other manufacturers. For one thing most of the conversation occurred with a police chief with swat experience. The main gist of what I learned was the Doublestar rifles run the gamut of price ranges, the rifles are highly customizable and the trusts Doublestar with his life and those of his officers. That’s a strong statement. But he made a point of the communication he has experienced with Doublestar. He stated, when looking for the right rifle to buy for the department he called and discussed his needs. They customized the order and the rifles to fit the need of the department. Further, instead of looking at what was offered on the wall, he suggested we discuss our needs with Doublestar and let them supply exactly what we are looking for. On the down side, they do not offer a left handed rifle. On the upside they have a lifetime warranty. Franklin Armory was a must see for me this year. After seeing the video of the Binary Fire System I needed to get my hands on it. If you don’t know the Binary Fire System is a BAFTE approved select fire system that doesn’t require a tax stamp. 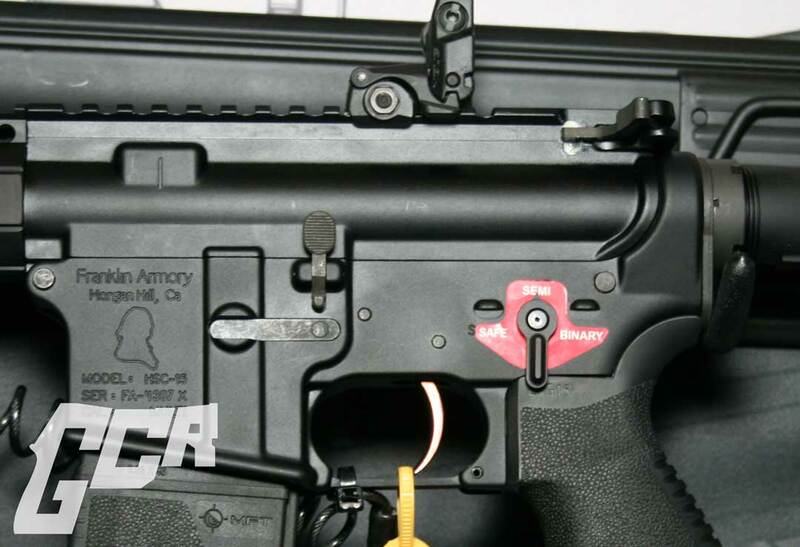 The selector allows switching from safe to semiautomatic fire to binary fire. 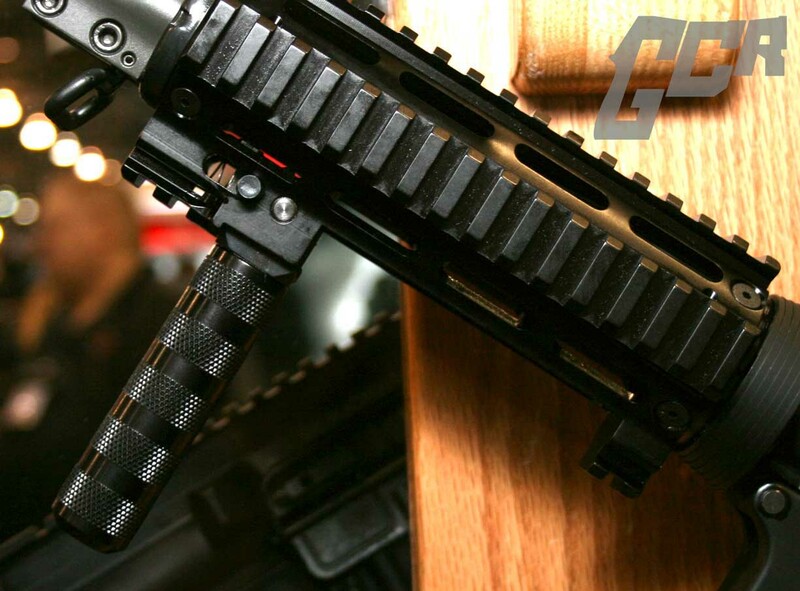 The semi selection operates as normal one round fired per trigger pull. When you switch to binary fire, one round is fired on the trigger pull and one is fired on release. My question was about how to hold back the second round when needed. The answer is simple, switch out of binary mode and no round will be fired on release of the trigger. So that clears up my concern. There is a minor issue with being able to outrun the mechanism but that just means if you get too excited you just charge the weapon again. Franklin also stated that all the parts for their weapons are 100% made in the USA. The downside for me is the lack of a stated warranty. The warranty offers coverage for the first owner for 1 year and after that point they encourage the owner to let them look at the problem and fix it at their discretion. When asked about setting themselves apart, Radical gave a popular answer about manufacturing most of the parts in house for their rifles. I didn’t get the chance to shoot one but in handling the rifle felt light and comfortable and solid. But Radical set themselves apart in another way to us. They said they offer a solid base model AR to build on at a very reasonable price. In this saturated market, it seems that a low price solid rifle is hard to find. This may very well be that rifle. In fact, optics ready it may come in under the price of a S&W M&P 15 sport. AND they don’t skimp on the dust cover or forward assist like many do in the lower price ranges. Let me be clear, my impression of Radical was a very positive one. I’d like to learn more. So right away let me point out I am using Remington as the heading because they own Bushmaster and DPMS. When I told them I needed a good base rifle to build on and use as a base for testing, they took me to the DPMS ORC. The ORC is another possible good fit for that entry level rifle with everything being at least mil-spec. When asked why I should buy the DPMS rather than the S&W in the similar price range, they simply said DPMS has a much longer history in the AR market. That’s a valid point and worth consideration. I have one word, “Trigger”. My visit with Rise really raised my eyebrows. While the rifles looked fantastic I am pretty sure that they were outside of the price range I would consider. After all I am looking for a solid base to add on to and not something that’s already customized. That said I think the Rise trigger options are in my future. Rise offers a competition trigger, the red trigger, known officially as “Advanced Performance Trigger”. It’s single stage 3.5 lb pull simply feels nonexistent with super quick reset and no over travel at all; and it’s probably a bit much for me. The other option is the black trigger, called the Super Sporting Trigger. This one is also 3.5 lbs but has enough travel for me to feel (but just) and a short reset. This trigger will find a home in my eventual AR rifle! The RISE Guarantee: If you’re not completely satisfied with one of our products, return it within 30 days in the same condition you received it in for a full refund. This guarantee includes guns after you shoot them. Rise Products are also covered by a lifetime manufacturing guarantee. 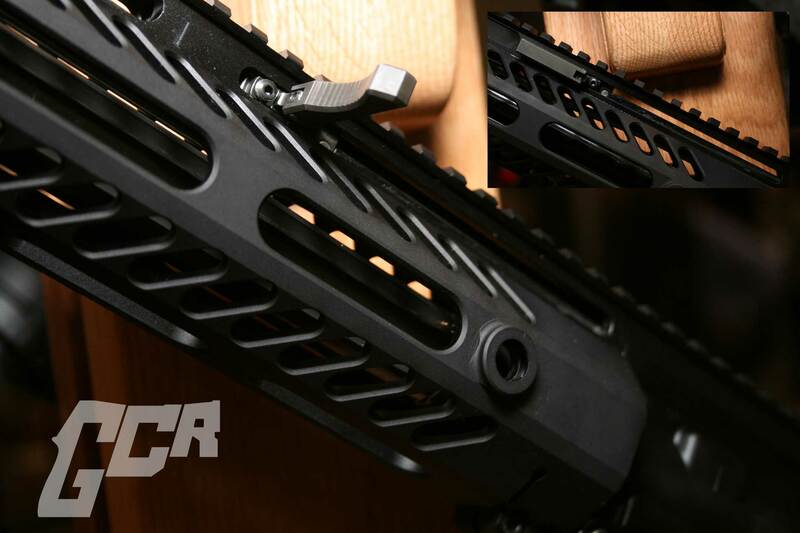 Rock River is a very popular and respected company in the AR world. I wish I had found them on the range but I don’t think they feel they need to be there. They are well established and probably correct in that opinion. The Shotshow booth for Rock River Arms shows you how well they are doing by its shear size; it’s up there with the biggest names in the industry. Or conversation with Rock River was multifaceted when we discussed what sets them apart. The first thing was most of the rifle parts are manufactured in house. When I said I had heard that line several times and that some say all the parts are made in house I got a chuckle. The chuckle was well founded when he said very sensibly that nobody makes all the parts (i.e. the springs, the screws, nuts, bolts and nobody makes their own magazines). That argument sounds reasonable to me. But there was a lot of talk about the importance of local sourcing and workmanship and an attention to quality. We were walked through a multitude of rifle options offered by Rock River and they had some nice options. They have an SBR option PDW-A4 that has a redesigned interior with a significantly shortened buffer tube allowing for a much more collapsible stock and an integrated pivoting vertical grip. Another option I liked was the LAR15 IRS-2 Standard with its rail integrated flip up sights, non-reciprocating flip out forward charging handle and two chamber muzzle break that was designed to reduce bullet yaw and increase accuracy by bleeding off some of the gas before the bullet passes through the last chamber which effectively stabilizes the round. Finally we were shown a nice selection of left handed models to choose from as well. All of these LAR models we saw carry a limited lifetime warranty. 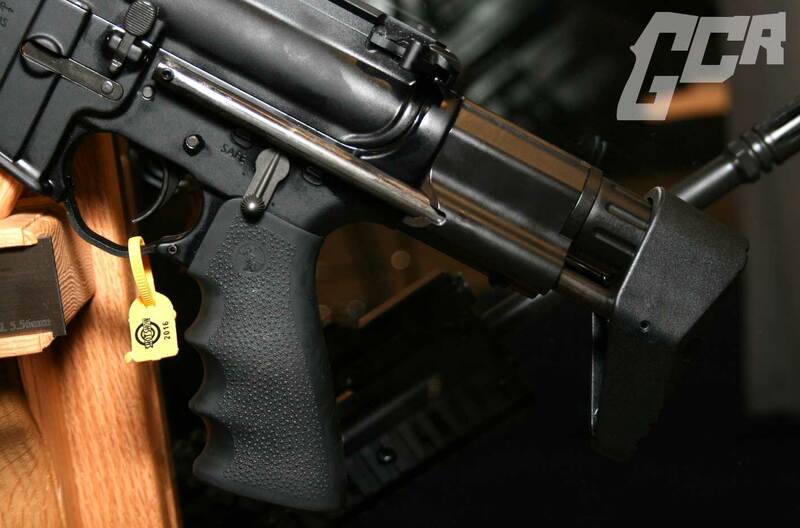 Of course S&W was well represented at SHOTShow and they do offer a good base to build on with the M&P 15. It shoots fine and is about what I expected. The downside for me; I will need to buy an upgraded model if we go with this line as I will need optics ready and the base model comes with the front sight which will just get in the way with accessory testing. At the price point, it’s a good choice for a shell. You can buy it and part by part customize it any way you wish. It’s far better than paying for a nicer rifle with custom parts that you want to replace anyway. Don’t pay for custom twice. One of the surprising finds at Shotshow 2016 for me was when I rounded the corner to see Stag Arms in the same location as last year. After the news of the legal problems of Stag in 2015 and the loss of their FFL, I thought sure they would be gone for good. So I stopped to ask about it. 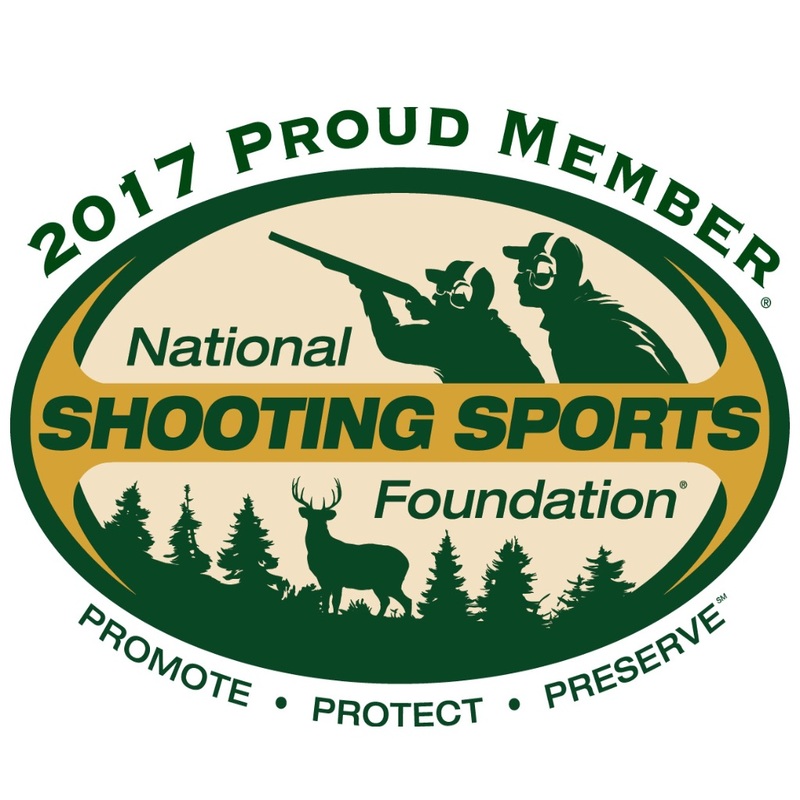 The official response from the crew at Stag: Stag is a great company making a great rifle line that had one person that failed to cover his legal responsibilities. At this time, Stag continues to operate as normal and has been given 1 year to move the company under new ownership and obtain new licensing. At this point Stag seems to be a healthy functioning animal going about it’s regular life only without a head. They seem to downplay the importance of the company head and perhaps all will go fine for them. I simply think it’s a little bigger deal than portrayed. But if we decide to get a Stag it will likely be the model 3 since it’s optics ready and available in a left have version for my second shooter. The rifles have a good reputation and are reasonably priced. Also, if the company survives, they have a transferable lifetime warranty. The Viking AR merits a mention for a unique design change. Viking has decided to cut the magwell on a 45 degree angle up toward the left side of the weapon. The result is a much larger opening to the magwell allowing the shooter to ‘rock’ the mag in place for faster reloads under stress. It’s an interesting idea and would likely speed you up with training. I came across the VLTOR booth on range day and actually shot one. 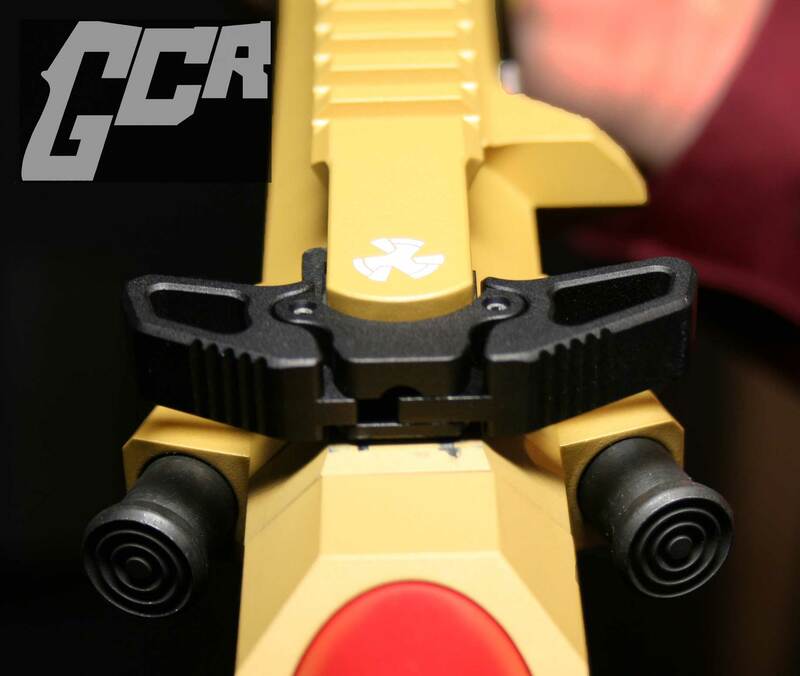 The VLTOR brand is known as the company that came up with the Keymod system. 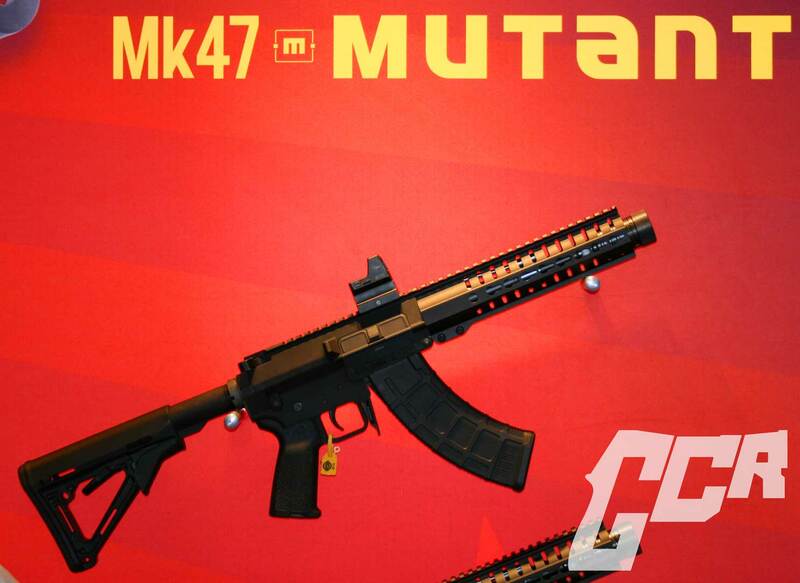 Depending on who you asked at the show it’s as popular as ever or on it’s way out to be replaced by M-Lok. So that’s to say, we have no idea how long Keymod will be around, short term or forever? In my brief experience, the rifle shot great but the price range starts a little high for someone looking for a base to build on. In the end, we have a lot of research to do still but I feel we learned some valued information and have a base to start from… maybe you can find something useful here too.